Oticon continues to build on the success of the award-winning Oticon Opn™ to bring the paradigm shifting benefits of the open sound experience to even more people – including those who want the convenience of rechargeable batteries. Oticon Opn™ miniRITE hearing aids will now be available as a rechargeable hearing solution that can be charged overnight for sufficient power to last throughout the day. All Oticon Opn miniRITE hearing aids sold since the introduction last year and going forward can be retrofitted to be rechargeable. Oticon further expands the Opn family with the introduction of two new Opn styles and the integration of Tinnitus SoundSupport™ and Speech Rescue™ LX into all Opn styles and performance levels. The new small, discreet miniRITE-T and the powerful BTE 13 PP give people with mild to severe-to-profound hearing loss access to Opn’s revolutionary open sound experience. Even more benefits are available to Opn users with the addition of two proven features, Tinnitus SoundSupport™ and Speech Rescue™ LX. The newly added features offer customizable relief sounds for tinnitus suffers and improved clarity and speech understanding for people with high frequency hearing loss. With the easy-to-use charger, Opn miniRITE can now be powered throughout the day by simply placing the hearing aids in the charger overnight. The rechargeable solution give users maximum flexibility to interchange the rechargeable 312 batteries with disposable batteries if the user forgets to recharge the hearing aids overnight. It is estimated that one pair of environmentally friendly rechargeable batteries can save approximately 150-200 disposable batteries per year. Oticon Opn now combines the BrainHearing™ benefits of a balanced and rich sound experience that doesn’t overload the brain and a powerful solution for tinnitus relief. Tinnitus SoundSupport™ allows hearing care professionals to address the needs of people who experience both hearing loss and tinnitus with a wide range of customizable relief sounds including broadband and ocean-like sounds. The Oticon ON App gives users the flexibility to easily adjust relief sounds to meet their individual needs and preferences with just the tap of a finger. Speech Rescue LX works together with OpenSound Navigator™ and Speech Guard LX t to improve clarity and speech understanding for people with high-frequency hearing loss. The three-step “copy and keep” methodology rescues speech cues that might otherwise be lost and brings them back into the audible frequency range. Speech Rescue LX then transmits the temporal cues of high-frequency speech and, at the same time, “protects” lower frequency speech sounds to achieve frequency lowering with minimal distortion. 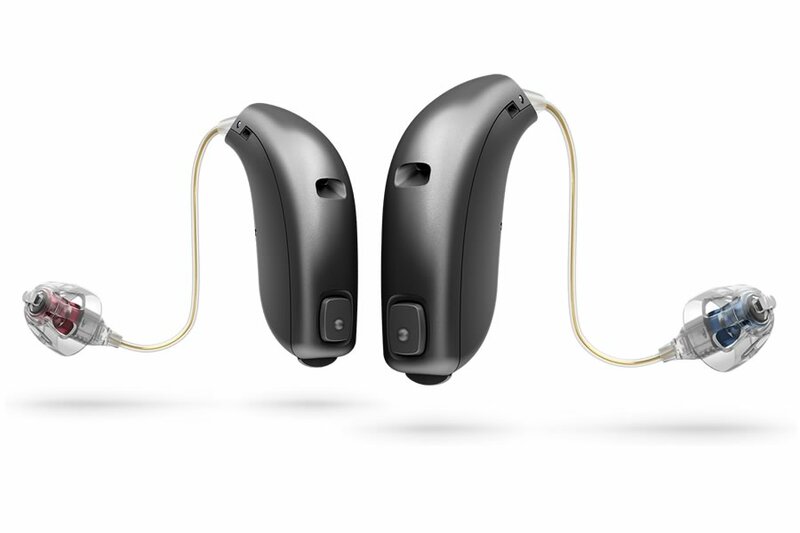 The Opn miniRite hearing aid is now available as a rechargeable hearing solution. Hearing care professionals can turn any Opn miniRite hearing aid into a rechargeable solution by simply exchanging the battery drawer. The popular miniRITE, new miniRITE-T and powerful BTE 13 PP and newest Tinnitus SoundSupport and Speech Rescue LX features are available in all Opn performance levels. A new firmware package 4 with the newest features, including Speech Rescue and Tinnitus SoundSupport, will be made available through the Oticon Firmware Updater in Genie 2. The newest firmware package enables hearing care professionals to continue to add improved and new features, as they become available, to Oticon Opn hearing aids regardless of style or performance level.